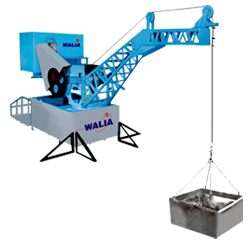 WALIA MINI CRANE is most suitable for lifting building material such as sand, aggregate, concrete, bricks, steel and other construction material. It is widely used in high rise building. No foundation is required for using this crane, self balanced with use in small counter weight by adding sandbags. Boom of 6.5fts with 360 degree movements, extra safety auto mechanical brakes on power failure and auto rewinding system.